Three Variations On the Plum (梅花三弄, Mei Hua San Nong, Guqin, 古琴) made its earliest appearance in the handbook Shen Qi Mi Pu（神奇秘譜）(preface dated 1425). Also called Mei-Hua-Yin（梅花引）or Yu-Fei-Yin（玉妃引. It was originally a flute piece composed by Huan Yi（桓伊）who lived during the Eastern Jin dynasty (317-420). 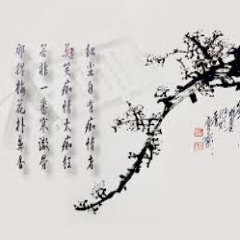 As the story goes, Huan Yi played this tune for Wang Huizhi（王徽之）, who was the son of the great calligrapher Wang Xizhi（王羲之）(307-365), when they happened to meet on the road. During the Tang dynasty (618-907), Yan Shigu（颜師古）rearranged it as a piece for the guqin.